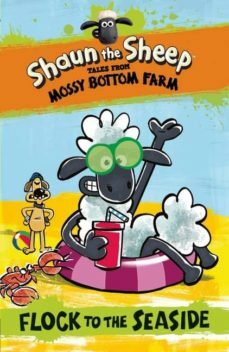 Characters from the CBBC and Aardman series Shaun the Sheep step from screen to page in the third book in illustrated fiction series Tales from Mossy Bottom Farm. Fans of CBBCs Shaun the Sheep will adore the third novel in the Tales from Mossy Bottom Farm series, which is based on characters from the top-rated TV show by Aardman (the creators of Wallace and Gromit). There are black-and-white illustrations throughout, plus comic strips and activity pages. The Mossy Bottom sheep are at a sheepdog trial in a field by the seaside, but the Flock are determined to enjoy the beach instead. Can Bitzer and Shaun get them back to the field before the trial starts?